A NEW bus route past the schools in Bromley Heath is putting children and other vulnerable residents at risk, residents fear. Since April, transport company First has been running the Number 5 Bristol to Emersons Green service through the estate along Quakers Road and Fouracre Road instead of via Queensholm Drive. Buses pass through in each direction every 20 to 30 minutes throughout the day. A number of people have reported difficulties with the buses getting round the corners and passing parked cars, particularly outside Bromley Heath Infant and Junior Schools. 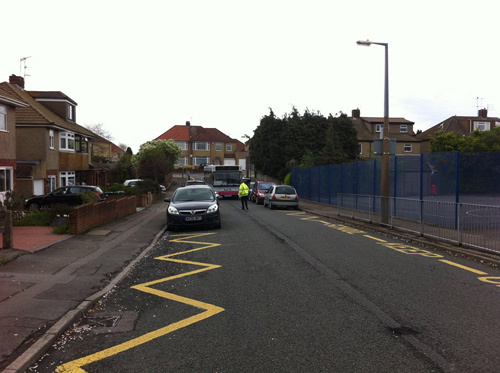 To make matters worse, the schools do not have a crossing patrol warden at the moment. Residents have used social media to describe a number of incidents, and several have complained to the bus company. Downend & Bromley Heath Parish Council has also written to First calling on it to revert to the Queensholm Drive route. Matt Smith, who lives in Quakers Road, close to the junction with Fouracre Road, told Downend Voice he was concerned at the increase in heavy traffic close to the schools, putting vulnerable pedestrians at risk. He said he had witnessed buses getting stuck at school drop-off times and when people were attending exercise classes held at the school. Mr Smith also highlighted the increased noise and the possible damage to a road surface that was already in a poor condition. “ I would have had reservations moving to this property with two young children, if I had known such a frequent bus route was to go right past the front door,” he said. One resident said she had been told the bus company would be asking South Gloucestershire Council to increase parking restrictions and issue penalty notices but a council spokesman told the Voice that no such approach had been received from First. The parish council traffic committee said in a statement that the new route, which had been decided “unilaterally” by First, was impractical because buses travelling in opposite directions often had to pass each other by the schools. “This section of road is clearly too narrow to allow buses to pass safely, “ the committee said. It added that a bus shelter in Queensholm Drive had been removed by the parish council on safety grounds. “Therefore there is no valid reason not to continue using this section of the route and that is exactly what [First] should do. This would remove parents' fears for their children's safety, which is paramount.